Swin Cash was a Forward for the UConn Huskies from 1998 – 2002. She was the 2002 National Collegiate Athletic Association (NCAA) Final Four Most Outstanding Player, after winning her second National Championship in three years. Swin is ranked seventh all-time in scoring at UConn with 1,583, sixth in rebounding with 910, and was the second player in Big East history to lead the league at the completion of the regular season in scoring and rebounding. She was selected number 2 in the Women’s National Basketball Association (WNBA) Draft to the Detroit Shock in 2002, where she spent six seasons. 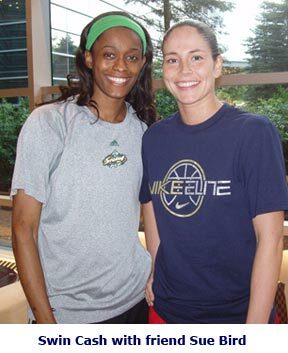 She is currently a team member of the Seattle Storm. This is a short list of accomplishments that could go on a resume for Swin. I had the pleasure of meeting Swin while her team was in Connecticut for a game in August 2008. Regarding high school basketball in Pennsylvania, the state is divided into Eastern Pennsylvania and Western Pennsylvania. “We won Western, Pennsylvania but lost the state championship in the Final Four.” Swin was humble when asked if she was the best player on her team responding, “I guess I was but a lot of other players on my team were really good too.” Swin was named Parade, USA today and Street & Smith First Team All-American, was ranked number three by Blue Star Index, named Gatorade Pennsylvania Player of the Year, and set a school record with 21 blocks in one game. Swin enjoyed many great accomplishments while at UConn. Among them were reaching her 1,000 points during her junior year in the Final Four, being Big East Conference Player of the week several times, and winning two NCAA Championships, three Big East Championships, and Big East regular season titles. In the classroom, during her junior year Swin became very interested in a variety of women’s study classes that influenced her in what she has done since graduating with a Bachelors Degree in Communications. “Through the classes I took I really embraced wanting to help young girls finding self esteem, understand their purpose, help them with their vision and the things they want to do in life.” After college Swin started a society “Cash for Kids” “The organization currently is set up in Detroit where I played, and Pennsylvania where I’m from. I’m working on expanding to other states, hoping to have something here in Connecticut.” Cash for Kids helps children develop skills educationally and on the court providing financial support to youth agencies and schools. The transition from college to the pros was effortless physically. “I had been playing at Connecticut, practicing against some of the best girls in the country. I was prepared physically. I felt I was prepared mentally but my first year was difficult.” There was talk that the team would be moving, getting sold, disbanding. Morale on the team was low and the team lost their first thirteen games. “I was used to a foundation that was about excellence and winning.” The team started to win a few games and team values, attitudes and spirits changed. There was hope even though they finished the season in last place. “The following year we came back to win the WNBA Championship, and made history being the first team that went from worst to first. It was magical. I left my legacy in Detroit by being a part of an organization that now the bar is set so high that every year Detroit is a contender to win the championship.” Swin continued to play for the Detroit Shock for a total of six seasons, and in 2008 was traded to the Seattle Storm. Swin is not the only talented basketball player in her family. She has an older brother who played basketball for IUP (Indiana University of Pennsylvania) in Pennsylvania; he is now in the army stationed in Iraq. She has a younger brother that played basketball at Texas A&M University-Corpus Christi, and is currently playing overseas. A younger sister in high school who plays basketball but will probably pursue nursing or become a future designer not a future basketball player. Swin is currently not married but is “unavailable” in a committed relationship.